World Religion Class is designed to teach the seventh and eighth graders the basic facts about world religions. Religion plays a large part in many individuals’ lives and shapes our world in many ways. In addition to learning the basic practices of religions, the goals of the class are for students to appreciate the diversity of world religions, meet leaders and members of various religions in order to ask questions, learn more from primary sources, and understand different religions, so as to make connections with historic topics. Our first visitor this fall taught the students about Judaism. 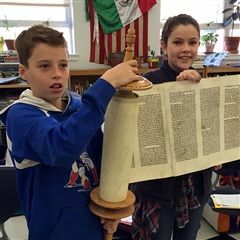 Rabbi Jonathan Kraus from Beth El Temple Center brought a Torah and tallit, and showed students what Hebrew writing looked like. Next came a lesson on Hinduism with Dilip Mathur who lit incense, built a small altar with Hindu idols. He led the students through a meditation and discussed the discipline of yoga. Celene Ibrahim, a Muslim woman and chaplain at Tufts University, demonstrated the Muslim prayer on her prayer rug. When students wanted to know how she knew where Mecca was so she would know which way to face when praying, she pulled out her smart phone and showed them her “Find Mecca” app. Her visit helped put a realistic and kind face to Islam, which is often shown in an unfavorable light in US media. The following week, Pastor Dan Smith from Cambridge’s First Congregational Church, and Father Murphy from St. Paul’s Parish, came to explain the similarities and differences between Protestantism and Catholicism. Both also showed different clothing items they wear for different purposes, and discussed various aspects of their jobs such as taking confession and leading social justice groups. In the new year students will hear about Buddhism, Atheism, and conduct an independent research project on an aspect of religion or religion of their choice. The class will conclude with students synthesizing all of this information, looking for similarities and differences between the religions we have studied.